Let your Light Shine, a photo by eatzycath on Flickr. I do love embossing folders - touching a card with lots of texture is a great joy... must be some kind of positive tactile stimuli (*smile*) - made using a Cuttlebug embossing folder, which name escapes me - looks like it's time for me to start labelling my Cuttlebug folders.... what a chore, maybe tomorrow or maybe next week? 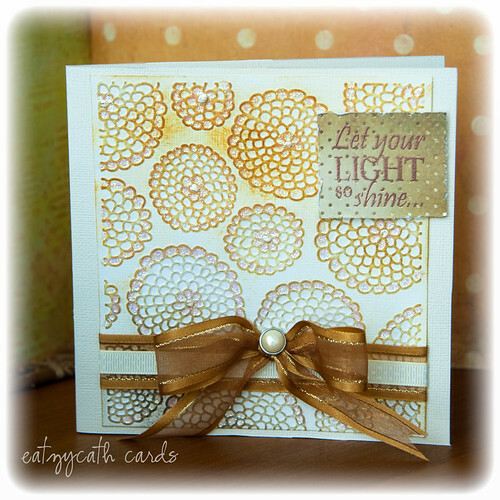 The sentiment is a stamp from IO - Impression Obsession. This was made for someone who had recently accepted Christ - what joy there must be in heaven as the angels rejoice and blow their trumpets! My prayer that she will continue to walk in God's grace and be a wonderful testimony for all in her life.